We initially developed a simple holding page for this client with a view to creating a fully functional website once deemed neccessary. 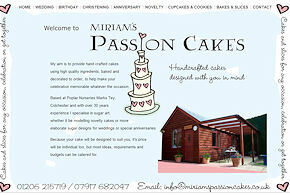 We've recently developed an aesthetically pleasing and intuitive website in order for her to showcase her bakes and cakes. 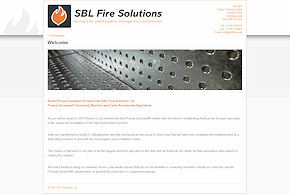 SBL Fire is a one-page informational website designed to look simple yet functional and attractive. 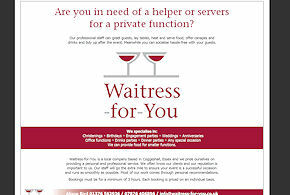 Waitress For You was designed as a simple one-page informational website in order to increase their presence on the internet through Google and such like. 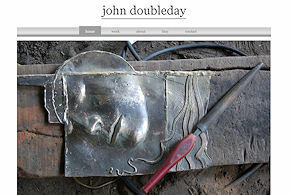 Our client here is an internationally acclaimed sculptor who sought a very minimalistic design in order to showcase his portfolio. 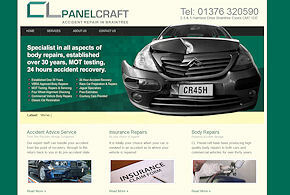 CL Panelcraft approached us to design and deliver a website to promote their bodywork repair centre. 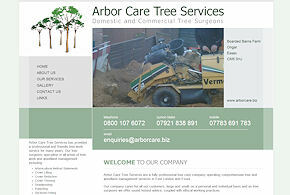 Arbor Care approached us with a request to redesign their existing website. In order to drive more traffic to their website we've recently guided the client through a social media campaign and applied Search Engine Optimisation to	their website.